As smooth as a baby's... Bedroom. Plastering the North East from Washington, Tyne & Wear. Welcome to Hill Plastering Services. We're a reliable, qualified and insured plastering company with over 16 years industry experience based in Washington, Tyne & Wear, covering the whole of the North East. We work domestically and commercially offering free no obligation quotes and also undertake insurance projects providing customer satisfaction in every single job. 16 years into service and we’ve worked with some awesome clients who love us and our services. 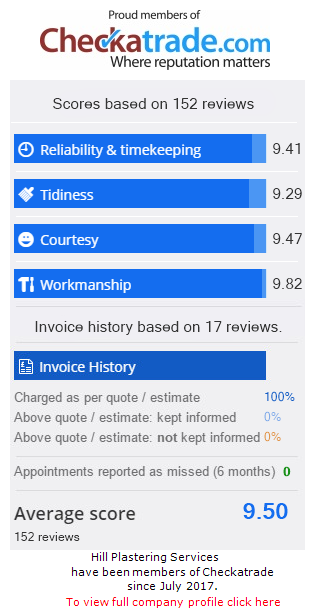 Check what they have to say about us... And visit our checkatrade page for more testimonials. Boarded up old fire-place and re-skimmed wall. Ceilings and walls plastered of sun room. Plastered my bathroom and stairway. Your message was snet successfully and we will response as soon as we can. Message failed. Please try again. base in Washington Tyne & Wear.